Hardline was formed by the Gioeli brothers; Johnny (vocals) and Joey (guitars) in the early parts of the 1990's, and they teamed up with Neal Schon (Bad English & Journey), who originally only was meant to produce their debut album. He had so much fun that he joined Hardline, and together with established musicians Todd Jensen (bass, David Lee Roth, Alice Cooper) and Deen Castronovo (drums, Bad English) they recorded their famous debut album "Double Eclipse" in 1992, an album many consider to be a milestone in melodic rock. Things worked well for some time with some very successful tours, but the band sadly broke up in 1995 when Neal Schon re-started Journey. Seven years passed and out of nowhere came album number two from Hardline simply entitled "II". Neal Schon had been replaced by John Ramos (Two Fires, The Storm) and while not a bad effort at all I never felt they reached the same levels as they did on their debut album. Seven more years has passed and the Gioeli brothers and John Ramos are ready to unleash another melodic rock monster to the masses. Joining them is Michael T. Ross (keyboards), Jamie Brown (bass) and Atma Anur (drums), and what a monster it has turned out to be! 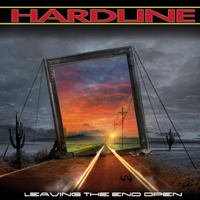 Amazing hooklines, Johnny Gioeli's incredible voice - in my humble opinion his best work ever, breathtaking ballads and the band's instrumental prowess make "Leaving the End Open" a fantastic album packed with catchy and heartfelt rock songs. "Leaving the End Open" is all the way up there with their debut album, yes it is that good! Rough, melodic and emotional in all the right places, the production is crystal clear and warm, the artwork is awesome and all of the pieces fit together, resulting in a brilliant album.